I don't blame you if you haven't given much thought to addressing wedding invitations. It's much more fun choosing the colour, design, layout and text for your invitations and stationery than thinking about envelopes but believe me if you have 50 or more to address by hand you might feel differently. Don't worry, I have designed the perfect solution to the problem and can now create matching, personalised address labels. Give your guests a glimpse of what's to come when they receive your invitations by continuing the theme onto all your wedding stationery. It's the little touches that make the difference and your wedding invitations will certainly stand out from all the other mail. The above are just examples to inspire you. If you decide to have a bespoke design for your wedding stationery I can create address labels that match perfectly. Please click here to contact me for more details. So what should and shouldn't you write on the outside of your envelopes? I don't always think it's necessary to comply with all the wedding traditions out there but do agree with etiquette with regards to addressing your wedding stationery. • If you're only using one envelope to hold your invitation (and not having an inner and outer envelope) and aren't personalising the invitation itself with guests names, remember to include the names of all those people invited on the envelope. If the invitation is going to the whole family you could include the words "The Davies Family". If it's only for parents and not children make sure you address it to "Mr and Mrs Davies". Unfortunately there isn't a one rule fits all answer to Addressing Wedding Invitations correctly. It's often best to check with people how they like to be addressed if you're planning to send formal invitations. It's also a good idea to include your return address on the outside of the envelope. That way if the invitation doesn't arrive at it's recipient it should be returned to you. 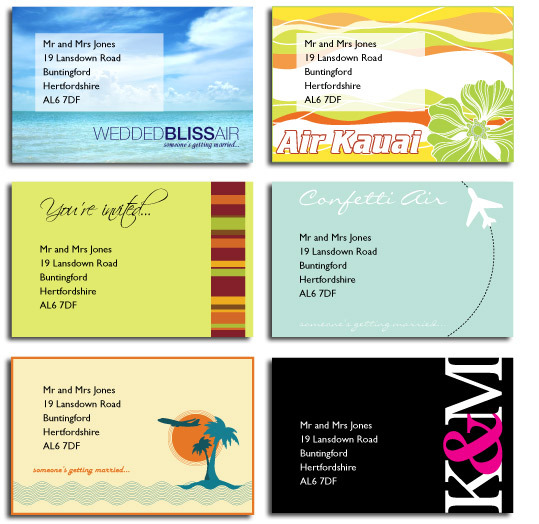 It will also mean guests have your mailing address if they want to post you an RSVP card. Why not consider buying a stamp for your envelopes? That way you can easily add your RSVP address to the envelope. The one above is from Amazon but there are plenty of other makes online. I could even design one for you using your monogram. If you'd like to explore this option get in touch.